Bornean beardit pig at the Lunnon Zoo. A pig is ony o the ainimals in the genus Sus, within the even-taed ungulate faimily Suidae. Pigs include the domestic pig an its auncestor, the common Eurasie wild boar (Sus scrofa), alang wi ither species; relatit craiturs ootside the genus include the peccary, the babirusa, an the warthog. 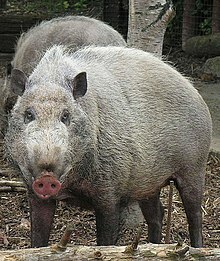 Pigs, lik aw suids, are native tae the Eurasian an African continents. Juvenile pigs are kent as piglets. Pigs are heichly social an intelligent ainimals. Wi aroond 1 billion individuals alive at any time, the domestic pig is amang the maist populous lairge mammals in the warld. Pigs are omnivores an can consume a wide range o fuid. Biologically, pigs are verra seemilar tae humans, sicweys are frequently uised for human medical resairch. ↑ "Piglet - Definition and More from the Free Merriam-Webster Dictionary". Merriam-webster.com. 31 August 2012. Retrieved 15 September 2013. ↑ Angier, Natalie (10 November 2009). "Pigs Prove to Be Smart, if Not Vain". The New York Times. ↑ "PSD Online - Custom Query". usda.gov. ↑ "Pig And Human Digestive System". prezi.com. Retrieved 15 April 2016. ↑ Loren Grush. "Why pigs are so valuable for medical research". Fox News. Retrieved 15 April 2016. This page wis last eeditit on 13 Februar 2018, at 23:14.